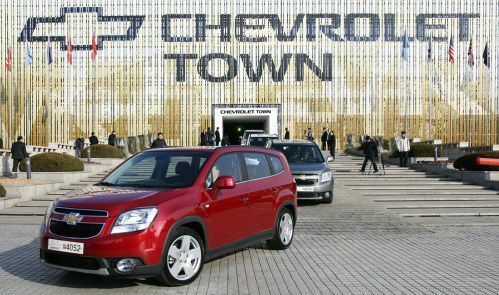 GM Korea began its Chevrolet product offensive today by creating a brand new segment with its all-new seven-seat Active Life Vehicle (ALV), the Chevrolet Orlando, at “Chevrolet Town” in the heart of Seoul. What is an ALV? It’s – part MPV, part crossover – breaking the rules of a historically conservative segment. According to the GM media statement Orlando makes a statement and stands out from the crowd. It is the perfect vehicle for today’s modern family and combines fun, entertainment and relaxation all in a single package. The product name, Orlando, also conveys the family-oriented character of the vehicle by creating a connection to a popular family destination in the U.S. state of Florida. Chevrolet's new ALV has a bold look, with its low roofline and crossover-inspired silhouette, while retaining the distinctive and recognizable Chevrolet “face” depicted by the split radiator grille and bow-tie badge. While the exterior of the new Chevrolet Orlando is sure to attract plenty of attention, the interior, too, features many of the latest design cues from Chevrolet such as a Corvette-inspired dual cockpit and ambient blue backlighting in the center console. Distinctive design is nothing without well-thought-out functionality. The “theater-style” seating arrangement of three rows of seats, the generous load area and the numerous storage solutions will also grab the attention of family motorists. You got that right. Chevrolet is willing to place diesel engine in Korea before any offering in America, which just seems wrong. One has to wonder who is really making the powertrain decisions. GM Korea is Korea's third-largest automotive company, and represents one of GM's largest manufacturing, design and technology hubs. It operates five manufacturing facilities in Korea as well as an assembly facility in Vietnam. In 2010, GM Korea sold domestically and exported more than 1.84 million vehicles, including CKD products, primarily under the Chevrolet brand. GM Korea produces one out of every four Chevrolets sold worldwide. It provides market- and brand-specific vehicle kits for assembly at GM facilities in China, Uzbekistan, Mexico, India, Colombia, Russia and other countries.